When we decided to get another dog, I asked for a breed that could run with me. I’ve seen other people run with their pups, and it looked like fun. I didn’t realize at the time that it would lead to a bit of… insanity. We wanted to stick with pugs, but we were afraid that we wouldn’t be as lucky with the next one as we were with Dublin. He hasn’t had any of the typical pug medical problems, but the next pug might have several. With this in mind, we started looking at mixes and quickly settled upon a puggle. Puggles have a better airway than pugs, and their beagle half gives them an unreasonable amount of energy. Black puggles are a bit rare. I took her out for a couple of short runs when she was a few months old, but any real distance would have to wait until she had a full year. According to our veterinarian, her bones would be full-grown and properly ready by then, and it happened to coincide with the next spring thaw. So hey, we could start running when the weather was better! Here’s something you should know about puggles, especially if the beagle side appears to be more dominant. They have energy. Lots of it. We’re talking about a massive surplus which must be expended in some way. They also have super-noses, and feel a desperate need to Sniff the World. Any change in the environment, whether it’s snow, autumn leaves or just a light rain, will spark a brand new investigation of the outside environment. I was told by another puggle owner that he allocates 45 minutes after every lawn mowing for his dog to carefully inspect the back yard. They also respond to shiny objects or squirrels in exactly the way you would make jokes about. When she was a puppy, a falling leaf would inspire a ferocious pull on her leash, which would be interrupted when she saw another leaf. Or a squirrel. Or a bird. Or basically anything that moves even slightly. And don’t get me started on how vocal she is. So this is what I started with before I became her personal trainer. 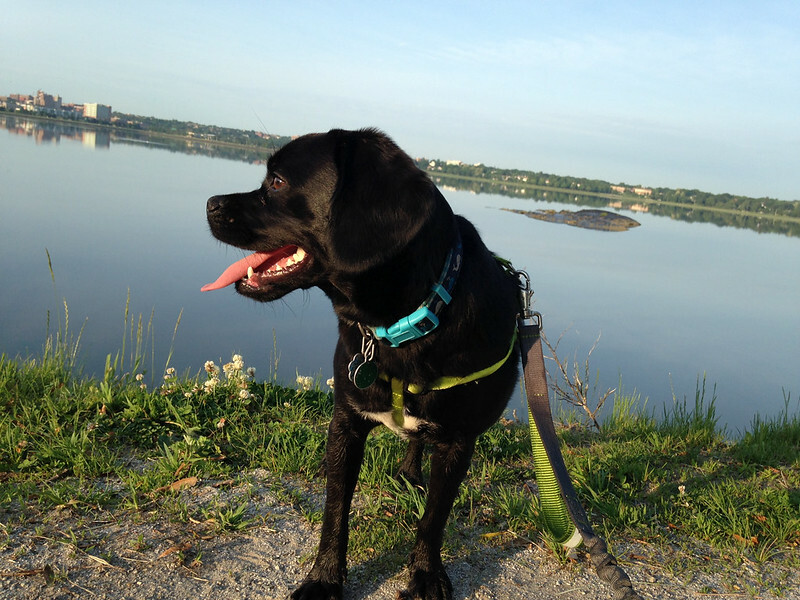 I’ve been running with this dog for a while now, gradually establishing a standard 5K routine. It’s gotten to the point where she starts flipping out when I start putting on my running clothes. She knows exactly what I’m about to do, and she seems terrified that I’ll leave without her. When I have gone without her, my wife reports that she spends the entire time moping and whimpering. First she cries at the door, and after a few minutes she just paces the apartment and mutters to herself. With this in mind, I don’t run without her very often these days. I’ve fallen into a pattern of worry and frustration. First I worry that I’m taking her too far or pushing her too hard, and I give her some breaks during the run. Then, when we get home, this happens. This happens quite a bit. 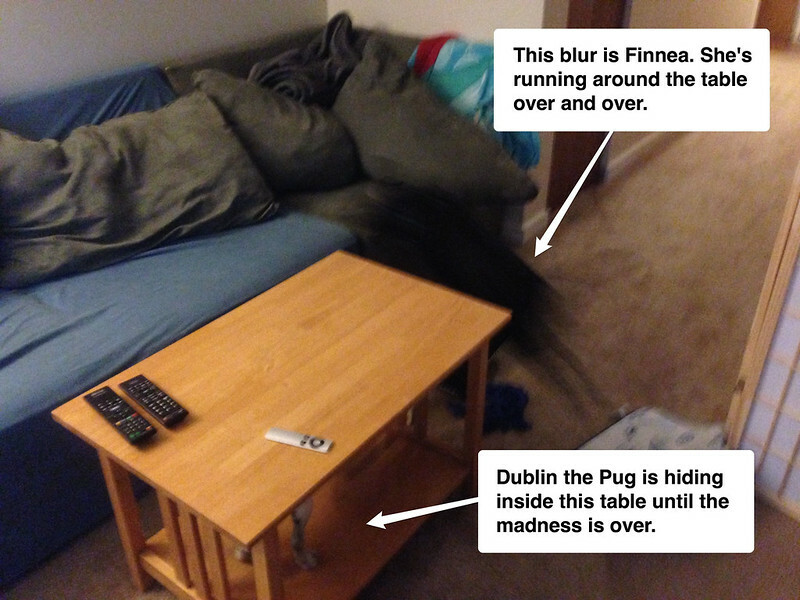 Our pug just waits until she’s used up her remaining crazy. She does laps around the apartment and demands that our 8-year-old pug join her. This lasts for a few minutes before she calms down. In the end she’s much more relaxed than she is without the run, but this type of Crazy Time appears to be unavoidable. I’m pretty sure that Finnea will be a 10K dog (or more) before it’s all over. She doesn’t have my endurance, but she can recharge almost completely with a 30-second break. It’s really something to see. I’m going to crank up the training gradually and keep watch to make sure she’s okay, but so far she’s just getting stronger by literal leaps and bounds. It’s already become necessary to run with her occasionally in order to guarantee some peace in the house. But I’m not complaining. It’s nice to have a partner out there, and Finnea brings a smile to everyone who sees her. And she’s gotten me out there more than once when I would have skipped a day. I still like to do the occasional long run without her, but aside from that I’m starting to think of running with her as a necessary part of my day.